When I first heard the words 'project work' I immediately thought back to late nights with mum sticking pictures onto a large sheet of cardboard and worrying that my handwriting was neat enough to warrant my teachers seal of approval when I gave my morning talk, entitled 'All About Apples' the next day. This was definitely not something I wanted to inflict upon young children and, at first, I dismissed the idea. 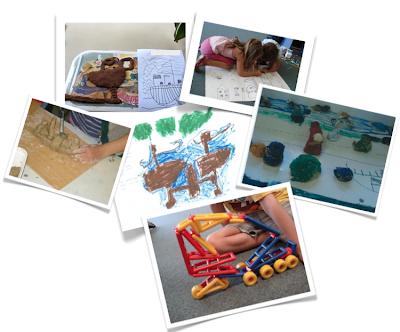 However, I have since learnt that project work is a keystone of the Reggio approach and, in their context, refers to in-depth investigations usually undertaken in small groups and allowing children to make fuller sense of their world and the things they wonder about. Throughout a project children are encouraged to share their ideas, ask questions of each other and relevant experts, seek out information, collect artifacts and represent their new understandings and ideas in a wide variety of media and symbolic systems or as Loris Malaguzzi puts it - 100 languages. Now this is my kind of project work! I now try to undertake a number of projects with my kids each term. I am still learning what makes a really good project - whilst some take off and capture the imagination and interests of the children some fall flat and don't go anywhere at all but this is what I really enjoy about teaching - seeing, each day, which direction the children will take their learning and watching them grow in confidence as powerful learners. Have you undertaken any projects with your kids lately? What do you think makes a project successful? My kinders are very excited about the polar regions. They are drawing, talking and writing about the regions. They decided to create a polar landscape on top of a table by collecting items from the classroom like stones, clear rocks, vinyl animals, fabric ... and it is still going strong after three weeks. Each day they add new facts to a schema chart, work on a polar landscape mural, build polar homes with blocks, fabric, write about polar animals and most recently they created a polar scientist station. Lots of fun. They had done lots of fun hands on science experiments like melting ice bergs, replicating movement of ice floes, exploring blubber and oil/feathers. I introduced painting with water colours and they have been busy creating northern lights using water colour paints. Their landscapes are beautiful. I am so impressed by my kinders when I look at how much they know.